We can offer our guests a hands-on experience of our native sports (archery and darts). The distance to the target is about 145 meters (476 ft). The relatively small targets are cut from wood and brightly painted, usually measuring about 3 feet (91 cm) tall and 11 inches (28 cm) wide. Bull’s-eyes are called karay. 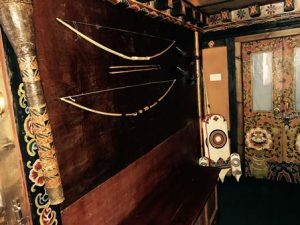 Traditionally, Bhutanese bows are made of bamboo and arrows from bamboo or reeds, fletched with feather vanes. Arrows may be painted and tipped with metal arrowheads. Quivers may be wooden, with an animal hide covering and a woven strap. Khuru (darts) is a popular outdoor team sport often played during festivals and archery tournaments. It is played all across Bhutan and can take up the entire day, often continuing long into the evening! It’s similar to dart but the size of the dart is bigger than the usual plastic dart with metal tip. “Khurus” are carved out of hard-wood and there is no restriction on the weight or the size to be played. To strengthen it metal-casing or other feasible casing is done on the lower end. A “khuru” can weight anything from 150gms to about 300gms. The distance between the targets is about 25-30 meters and the target is almost 11 inches by 5 inches. More than just the game it’s the spirit of the game which makes it lively. Teams sing and dance on each strike making the game even more interesting. Cheering and jeering is the part of the game. There is no age limit or retirement age for any players. As long as one can throw it straight and at the target, one can qualify as a player.